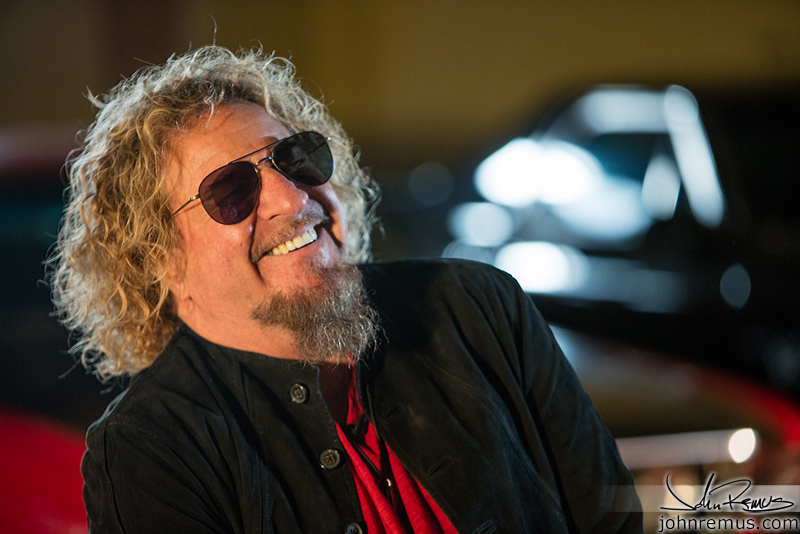 My day shooting Sammy Hagar. So it was a phone call somewhat out of the blue. A good friend of mine, and fellow photographer, down in LA reached out to me on a Wednesday to see if I would be around that weekend. I was momentarily caught off guard because he knows I no longer live in Southern California. But it turned out he was asking if I would be in the San Francisco Bay Area and available that weekend. He said he might have a lead for me on a project he knew I would dig. And after a few various emails that afternoon, and confirmation the following day, I was booked to shoot Sammy Hagar for AXS TV and Mercury Insurance! Growing up I had listened to Van Halen, AC/DC, Led Zeppelin and all those classic rock groups with my dad. So I knew of Sammy and his music. Mike Bell, a portrait session. 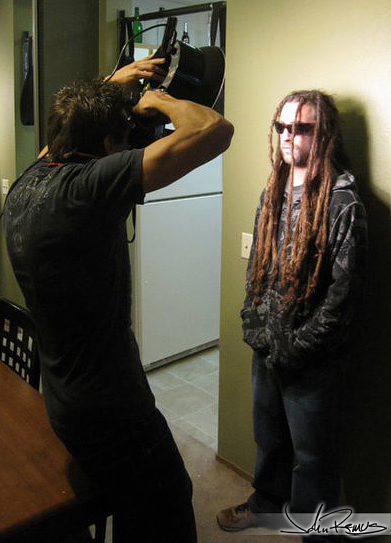 Mike Bell, a sound engineer from the Bay Area, has been rockin’ dreadlocks for nearly 10 years. 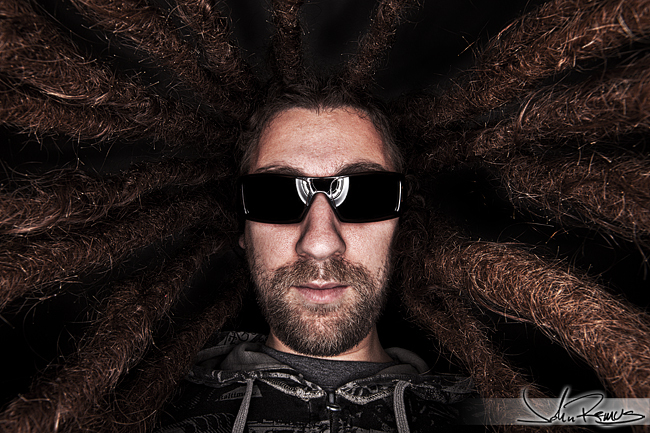 So when it comes to creating a really unique and equally awesome portrait, he fits the bill perfectly. I’ve actually known Mike for a long time – and we’ve talked about shooting something in the past. I’m glad I waited until now to actually shoot since I’m much more skilled at this point than years ago when I first talked to him about it. I wanted to create a gritty, darker, almost rough appearance in the shots. 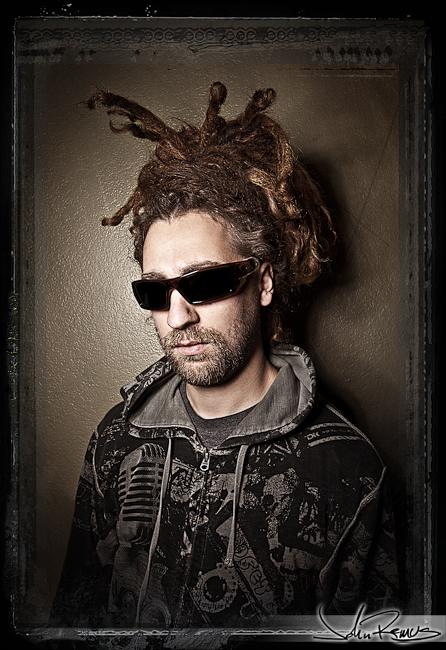 Something that would emphasize both his dreads and beard. And judging by the comments that people have already began making on my facebook albums, it looks like we accomplished just that. This was the original concept. Clean. Simple. Next we tried this shot. It was something Mike had seen in the past and wanted to try. Came out pretty cool actually. I really like this side profile shot with his hair up. I felt like the treatment and border gave it a lot of added character, too. The last thing we tried was a shot with a hooded sweater. This was TJ Lauters’ idea. He was on the set doing some behind the scenes photos and taking some video. Here’s one of the behind the scenes images that TJ snapped while filming. TJ is currently working on a short video clip of the shoot. I’ll either be posting that here, or to my Facebook page (or both) as soon as it’s done. Come back soon! I’m discussing three different shoots with three different models right now for this week. 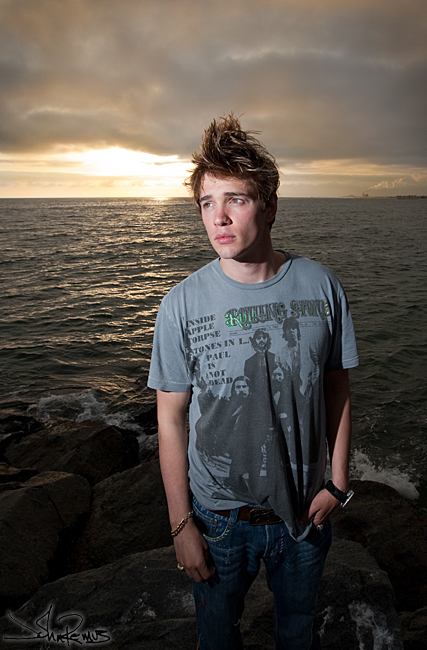 Derek Jameson, singer/songwriter and musician in Hollywood, is a very old friend of mine. And, being old friends, Derek has called me up a couple times when he’s been in a pinch for photos. Two weeks ago was one of those times. It’s frustrating for anyone who pays for any service and there is a delay on that product. I can’t imagine what it would be like to have photos delayed being delivered to you. Well, that’s exactly what Derek was dealing with… a photographer was late getting images to him, and Derek needed them that weekend for new promo material for upcoming shows. We went to downtown Huntington Beach for a quick shoot on the streets. 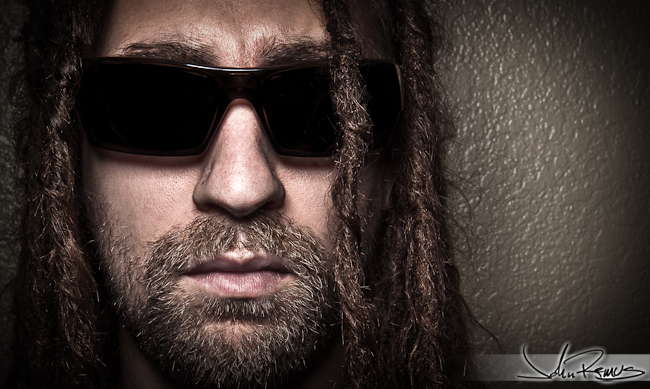 I originally planned to do a daylight shoot… so I didn’t bring my light kit to work with. Fortunately I still had all my strobes with me or else we wouldn’t have been able to do anything. The shoot went great. We kept it simple, and Derek made sure that things moved pretty quick and we were in and out. Images were sent to the graphic designer the next morning and promo material was created by the next afternoon. I’m glad that I was able to help him out on such short notice. I’m sure it’s not the last time I’ll be shooting Derek either. If you do a search on my blogs, you’ll find many of the other shoots we’ve done in the past for his cd covers and magazine features. Wow, March is flying by already! I started off the month up in San Francisco with some of the members of our car club, TOPDOWN. 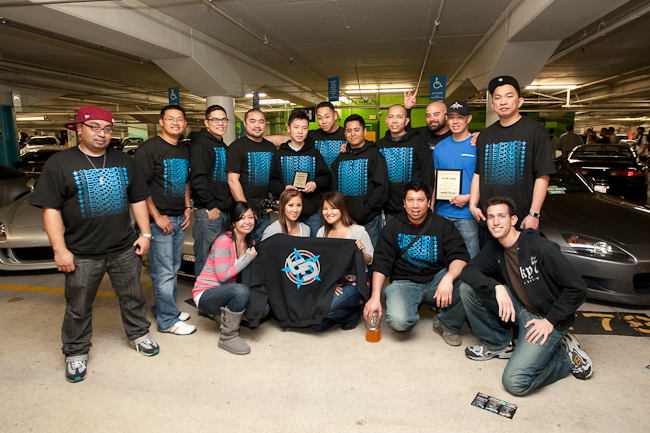 We attended Wekfest 2010 in Japantown and took home Third Place overall. Also, one of our members and really great friend of mine, Alex Doan took home a first place award for his Spoon S2000. For those of you familiar with the import community and have heard of Spoon’s black Honda S2000, that’s owned by Alex.. and he drove it up to the Bay Area from here in Socal to compete/show. So, I got to celebrate (a bit early) with a couple friends at Disneyland! Haha! TJ, me, and Laura spent the day running around the parks riding rides and taking photos. My old friend Phil signed us in (Thanks Phil!) 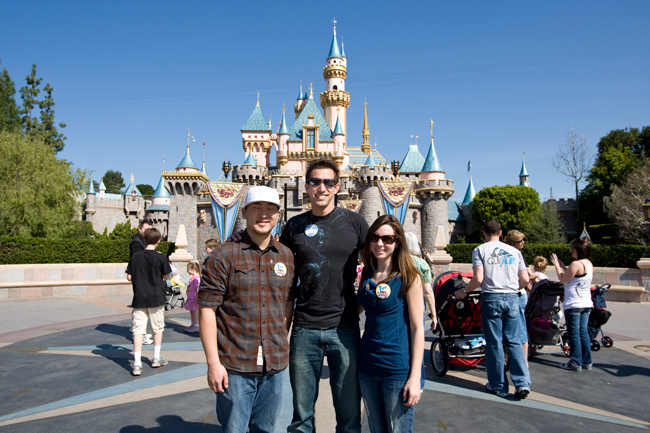 so we could enjoy the sunny weather and Laura could see Disneyland for the first time ever. TJ came along since he hadn’t been since he was a kid. Had a great time though! Now like I said, this month has been crazy running around and taking care of a lot of things at a more personal level. I’m relocating/moving soon – still based in Socal though. I’m planning some upcoming trips to the Bay Area, Oregon, and possibly to Sacramento, too. All are work related trips and involve logistical planning with clients/etc. And, my birthday weekend lasted about five days… I won’t lie. Hahaha! 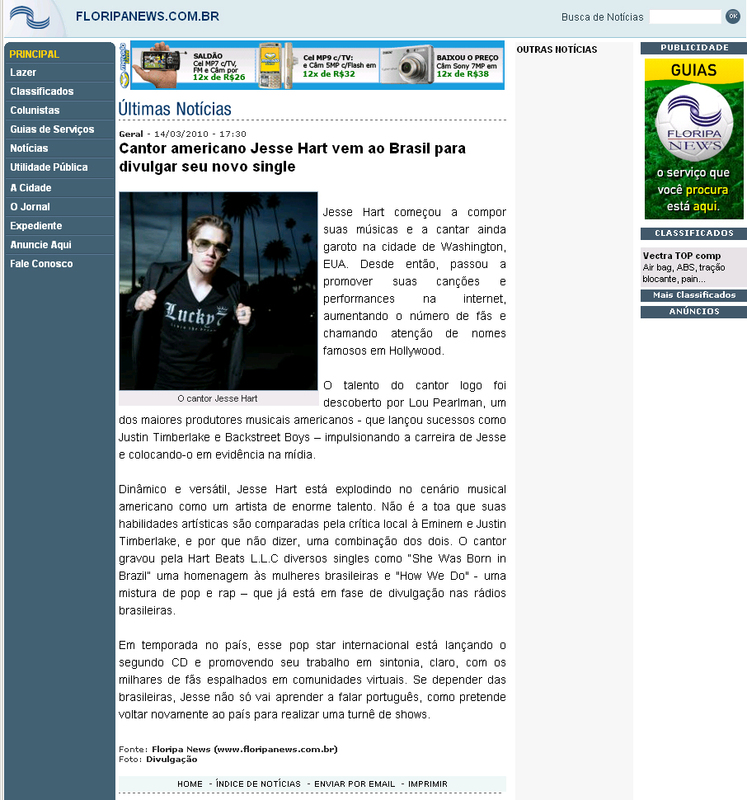 Jesse got ahold of me this morning, from Brazil, to let me know that one of my shots of him is being used on a press release there in Sao Paulo where he is currently doing shows. So, I’ve been published in Brazil now! Woo hoo! 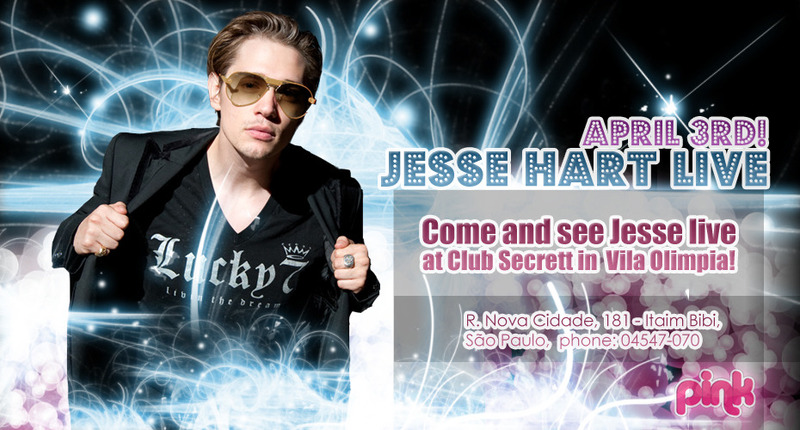 Jesse’s also running the image on his promotional material, and his new cd cover. I recently did a shoot with Derek Jameson. I’ve worked with Derek many times on promotional material, album covers, and his magazine feature that was published last summer. 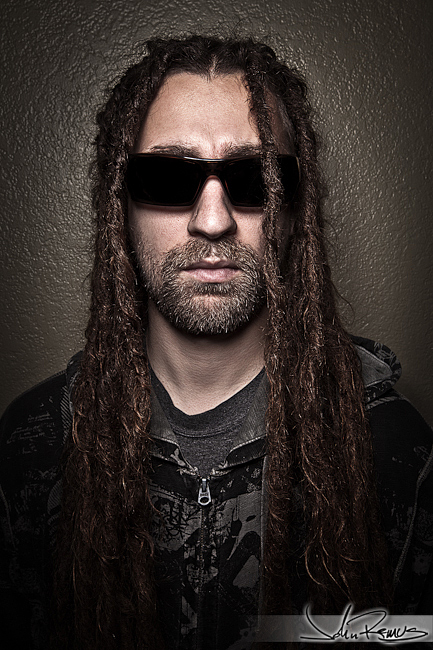 Derek called me up needing a last minute shoot for some upcoming shows. We did a very quick shoot in Huntington Beach – I’ll post more from that shoot on my next update. 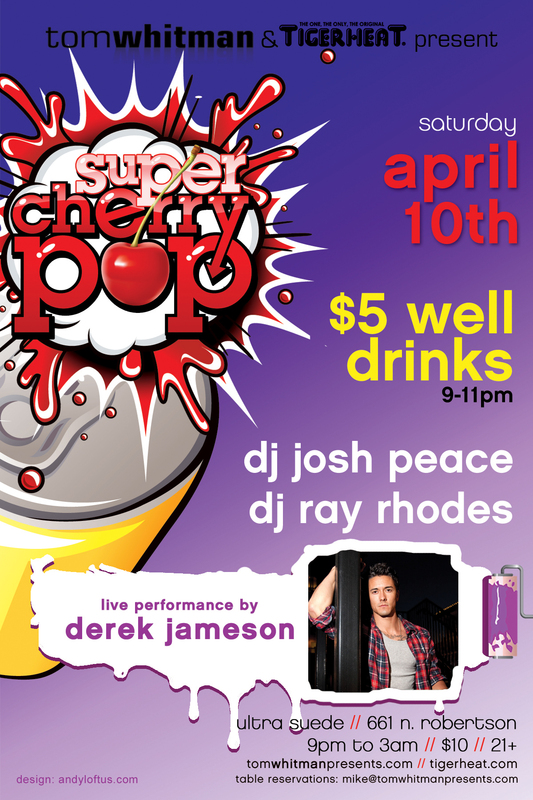 This promo poster uses an image of Derek from the shoot we did for his magazine feature in Unzipped, published July 2009. I may have shared this before now that I’m thinking of it… But, Rick Thorne uses my images on lots of his promo material. 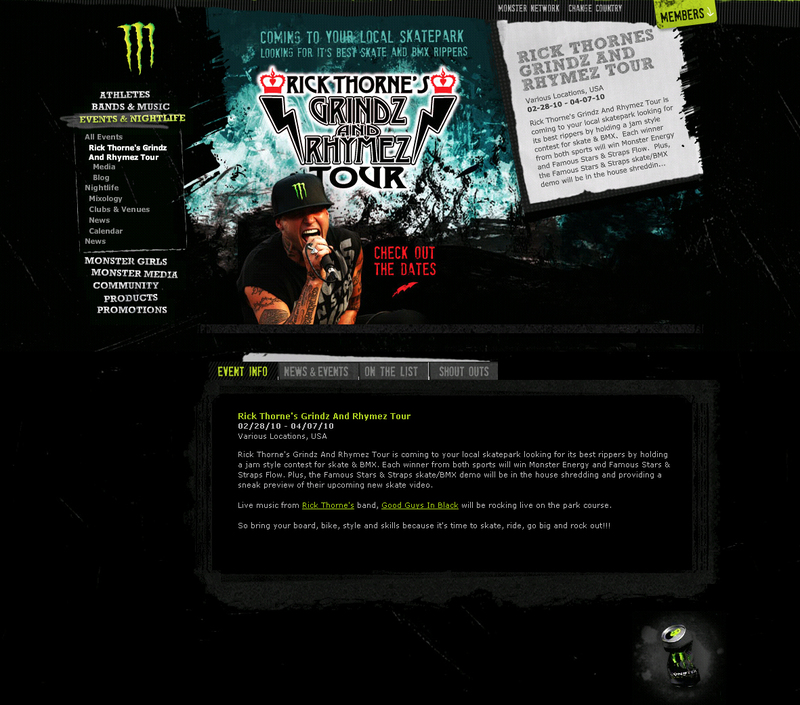 And, this image for his Grindz and Rhymez tour features my image of him on Monster Energy’s website. Anyway, that’s all for now. Not many new images to share with everyone just yet. I’ll have some new stuff up shortly, including another shoot with Derek Jameson (that I mentioned above). Hope everyone is having a great month! As busy as I am right now I’m still having a great time. Spent this evening catching up on many things – most of which weren’t photo related… things like car maintenance and errands, haha. But, the last half of the evening was all photo work. So, a quick update tonight to share with everyone another image of Laura Shields and Jesse Hart from our shoot in Beverly Hills a week ago. I think this one is a bit nicer than the previous one I shared. And I still have many more to go through and select for editing. But, I’m calling it a night. Just a brief blog update to share with everyone this image of Jesse Hart that I shot Saturday evening before we headed up to KRESS in Hollywood for the Models and Bottles party (see the previous blog entry). We were down hanging out in Newport Beach and climbed out onto the rocks to do some shots. This is one of the ones I liked and decided to edit. Jesse, I’ll get you the other images for your promo posters soon..
As for other fashion stuff… I need to schedule some shoots for this month since I’ll have a bit of time. And I have a really awesome engagement shoot planned and coming up quickly. 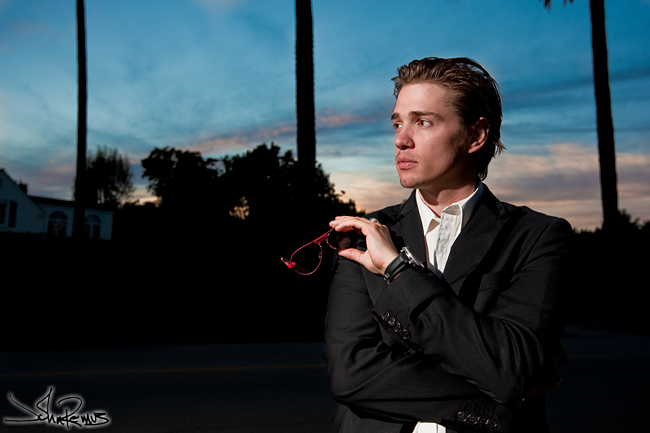 This evening I did a fashion shoot with singer Jesse Hart, here in Beverly Hills. I’ve known Jesse for a few months now, but while talking tonight realized that we were both at an event two years ago in Las Vegas – he was performing, I was there for graphics and video. Small world… it truly is “six-degrees” here in LA with everyone I meet and work with. We had a great time, created some really incredible images, and I’m looking forward to spending time going through the rest over the next couple days. For now, you all get this one teaser shot of more things to come. 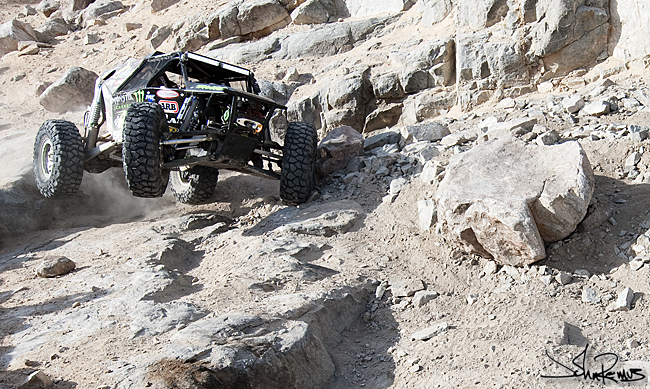 The King of the Hammers desert race and rock crawling… was insane! I was out there all day for work covering our drivers and sponsored cars (this isn’t one of them). It was a lot of fun to watch as some of these drivers just flew through these canyons and over massive boulders and 6 foot drops onto more rocks… Many drivers didn’t even finish the race. Yikes. The next week is already filling up fast. And there are going to be some massive trips coming up this year for me, too. Check back soon for more shots from both events in my portfolio update later this week. Rocked it out at the Geisha House in Hollywood a few nights back with Lucky 7 Lifestyle and Jesse Hart & The Fam. It ended up being a really great night, even though I was running late due to prior obligations I couldn’t get out of, haha. Ironically I ended up running into (VJ) Michael Benz and (Make Up Artist) Lauren Favorule who I’ve done a lot of work with. Also there was Brand, a model I’ve had the pleasure of working with multiple occasions (like this one). Met a number of entertainers and models I look forward to working with, and overall, just had a great time. I arrived late, like I said, so I didn’t really take many photos… mostly just having fun with friends rather than treating it like an event I needed to cover. Irregardless, here are the photos – or click the image above. 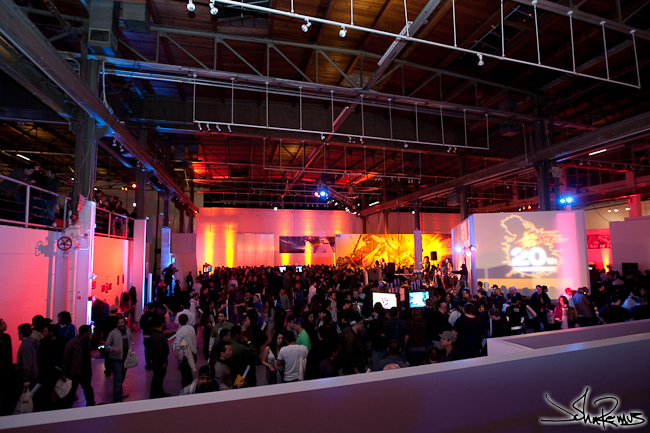 Also, last night I headed to Los Angeles again with the Topdown guys to MOCA (Museum of Contemporary Art) for the Street Fighter 20th Anniversary party and game launch. For those of you who don’t know, Street Fighter IV is about to be released… you hear that? That’s your inner child screaming for joy! Haha, it took forever to get in… line was huge. I was really tempted to just show my camera, say “Press” and walk through the door. But, that would involve ditching my friends. Once inside we had a really good time. Tons of free gift bags, posters, hats, and other commemorative stuff for people to pick up. I didn’t even think to check how many stations they had set up to play the new, not yet released, game… but it had to be somewhere around 50. They also had some of the really old arcade systems there with the original Street Fighter series. A contest was held to see who the best player was… I didn’t bother entering, nor would I have wanted to bother waiting in the line to compete. There was also live music, tons of prize giveaways. Free laser phone-engraving of any Street Fighter logo or character (I was tempted to have Guile etched on the battery plate to my Blackberry Storm, not going to lie), and food and drinks. Brought my camera, shot around with friends, nothing amazing, but posted a gallery up anyway. But, will hopefully be happening in the next week or so. 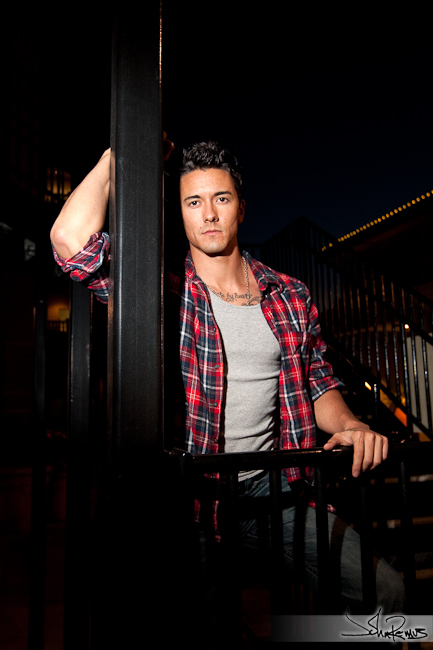 I’m also going to be working with Jesse Hart this upcoming week for a shoot in Hollywood/Beverly Hills. And, lastly, I’ll be in the Bay Area to visit Friday the 20th through Sunday the 22nd. S2000 Challenge Series kickoff, and an album cover..
Today was the kickoff event for the 2009 Speed Ventures S2000 Challenge Series – which a few of my friends are competing in. 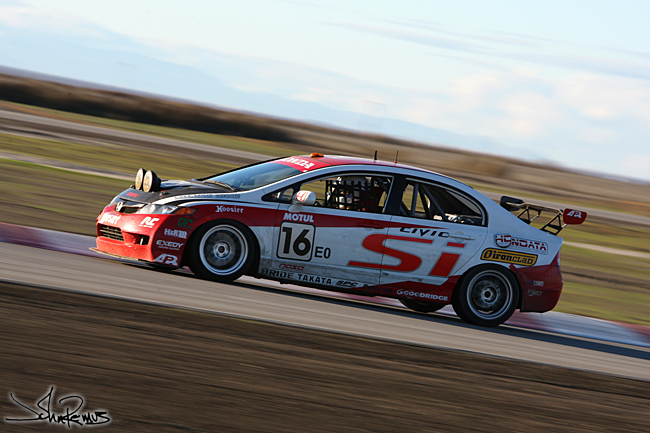 Now, the car above in a Civic SI, sure, but, it’s from today at Buttonwillow Raceway. I spent the morning, in the cold, extremely foggy, weather at Buttonwillow waiting for the sun to break through so we could start the day’s events. Honestly, it was not a good day to be driving… and I’m glad I wasn’t. Many drivers ended up in the mud, doing various levels of damage to their cars… everything from broken axels, to cracked bumpers and screwed up alignments. Unfortunately, one Evo driver even totaled his car when he lost control and slammed into the wall. Overall, photographically, I was quite pleased with my images. The above shot is among my favorites that I’ve seen so far. I’ll be sorting the rest, getting discs out to clients in the next few days, and updating my portfolio. This is an image of what the cd cover for Derek Jameson’s new album “Space and Time” will possibly look like. I photographed Derek last week here in Los Angeles after he got in touch with me to help him freshen up his photos with new shots. 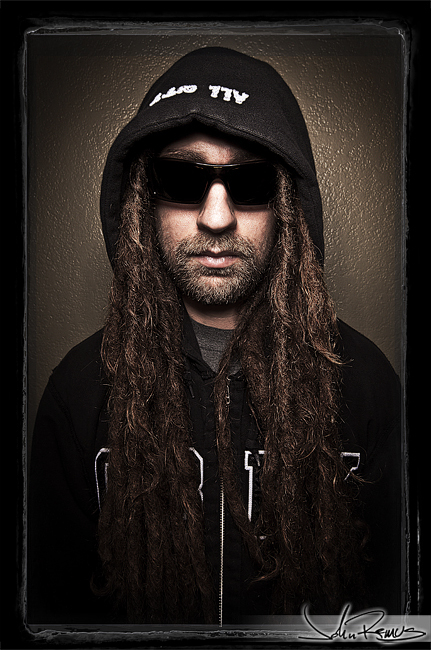 I’ve had the pleasure of knowing Derek for many years and watched his music grow and change during that time. I’ve always enjoyed his lyrics and felt I could connect with many of the songs. His music is available both on MySpace and iTunes. I’ll update you all when his new album is released with the new artwork. Well, it’s now 2am… I’ve been up and moving since 4am… which means it’s time for me to call it a (very successful) day. This past Monday was the FAME Industry Mixer in Downtown LA at Blue Velvet. 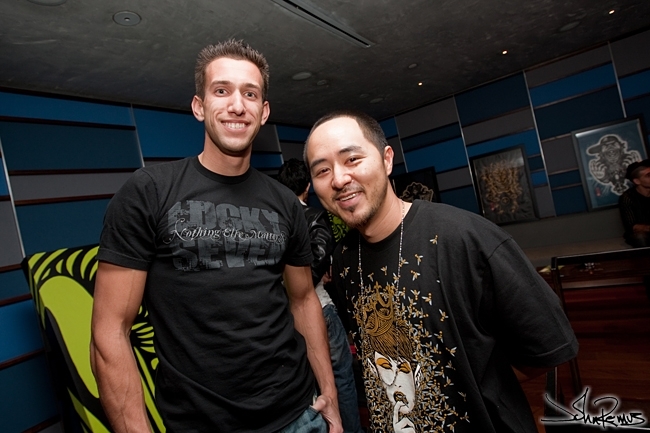 It featured the artwork of artist and designer Jason Lee. I first met Jason back November, I was the head photographer for a fashion show at Green Door, Hollywood, that featured the work of Blive Couture and SUBRAGE. SUBRAGE is Jason’s brand, you can check it out here. I’m looking forward to collaborating further with Jason in the future; we discussed a few ideas that I’m excited about. Also a shout out to London Moore of CNPublicity for putting the event together. And Lucky 7 Lifestyle (new site coming soon), since they were my fashion choice for the evening. Later that night I had to head to Hollywood. I met up with good friend, professional BMXer, Rick Thorne. As you guys know, I do a lot of work for Rick’s band, “The Good Guys in Black“. 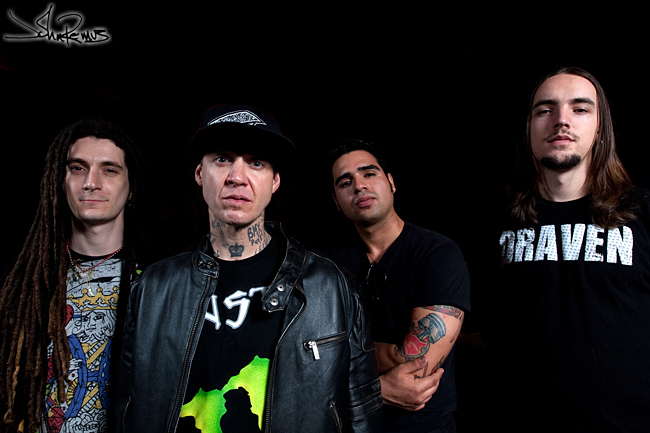 Well, they needed some quick band photos for some promo posters that were going to be created the next morning. Haha… no rush… at all. Because of the quick turn around, we went with a simple all-black background. We’ll do a location shoot the next time around. Should be a great time. 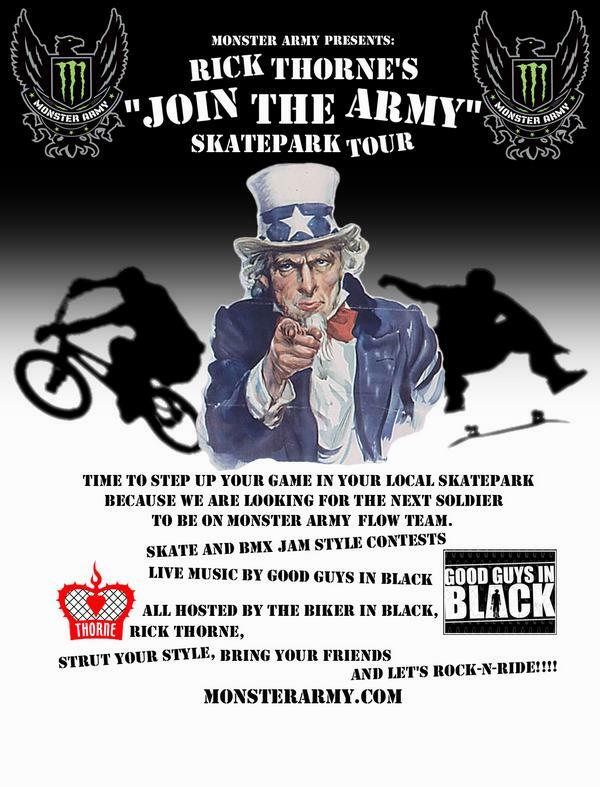 Sponsorship by Monster Army. 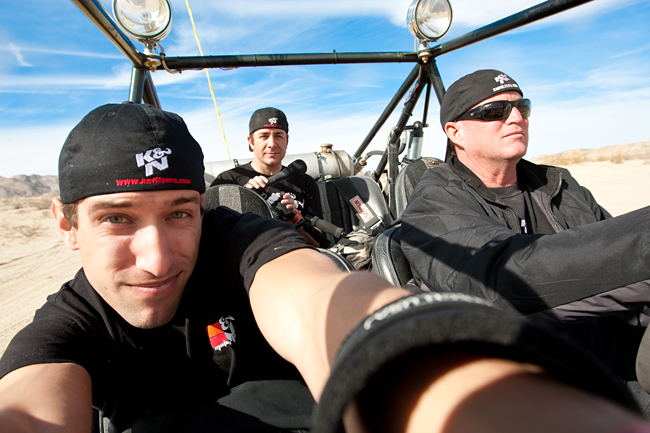 Seeking out the next extreme sports athletes… Can’t wait. So, that’s what’s currently going on with me.. I have more big news in the works. But, you’ll have to check back later for that.